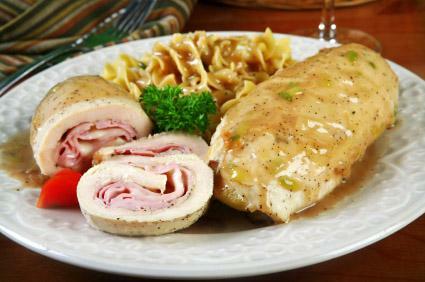 With so many chicken recipes, you might be wondering how to cook chicken cordon bleu and how to cook it with style. This classic breaded chicken roll of the gourmet world is rolled with ham and cheese complementing almost any side dish imaginable. This elegant classic of the gourmet world is simple, yet delicious, when made with fresh quality ingredients. The secret is in the ingredients: Traditional staples include quality smoked hams, gourmet cheese such as Gruyère and freshly made bread crumbs. Contemporary twists of the traditional dish include substituting smoked ham with Italian Prosciutto, turkey ham or bacon; bread crumbs are replaced with coatings such as flavored coatings, crushed cornflakes or different types of pastry such as French puff pastry. Gruyère is considered the best gourmet cheese to use, yet there are a variety of cheeses similar to Gruyère you could experiment with. There are a few standard culinary techniques of how to cook chicken cordon bleu. These techniques include baking the chicken rolls, deep frying the breaded rolls or pan frying the breasts until golden brown. If you're in the mood to try something new, why not give one of these versatile gourmet recipes a whirl? On one plate, add flour mixed with parsley, salt and pepper; and on another plate, spread the fresh bread crumbs. Beat eggs in a bowl; set aside. Place chicken breast in a food storage bag; tenderize with a meat mallet until each breast is about 1/4 inch thick or less. Roll each chicken breast firmly with layers of ham, Gruyère, prosciutto and Swiss cheese, sealing the edges with a toothpick. Lightly coat each chicken roll with flour before dipping into a beaten egg; roll chicken rolls in fresh bread crumbs and repeat. Chill rolls for one hour or longer. Heat butter in a skillet over medium heat; brown each chicken roll evenly for 10 minutes. Stir in 1/2 cup chicken stock; cover and simmer until chicken are cooked, about 15 minutes. Remove chicken rolls and set aside. Add 1/4 cup stock to the skillet, stirring over medium heat until browned skillet bits and liquid are well blended; add the wine, cream and tarragon. Simmer until the sauce thickens, about 1 minute. Preheat oven to 350 degrees F. In a bowl, beat egg whites with milk; add the Special K flakes to a plate, and set both aside. Between layers of parchment paper, gently beat chicken breasts with a meat mallet until breasts are about 1/4 inch thick. Brush the inside of each breast with a light coating of Dijon mustard. Roll each mozzarella stick within one slice of turkey ham; roll each ham and cheese roll inside a chicken breast coated with mustard. Seal the edges with a toothpick. Dip each chicken roll in egg white mixture; next evenly coating each roll with a low-fat crushed cereal mix. Repeat the process again. Chill cordon bleu rolls for 30 minutes. Arrange the rolls on a baking sheet and bake in the oven for 30 minutes until crispy. Preheat oven to 375 degrees F. Thaw frozen pastry sheets at room temperature for about 25 minutes. In a skillet, cook peppered bacon until crispy; cool and crumble. Whisk egg and milk together; set aside. Unfold thawed pastry puff onto a lightly floured surface. Roll out the puff pastry to about 14 inches; slice each sheet in half. Layer each pastry half with one ounce of Gruyère cheese, a slice of ham, cooked chicken, one-quarter crumbled bacon, and one ounce of cream cheese. Brush edges of pastry with egg-milk mixture. Fold pastry corners upward; seal and crimp the edges. Brush pastry with egg-milk wash.
Place cordon bleu puffs on a greased baking sheet; bake for 20 minutes or until golden brown. When flattening chicken breasts, be careful not to create tears in the breast meat. Never use a textured mallet; use a flat mallet to beat breasts 1/4 inch thick or less. Try finding tenderized breast meat saving you valuable time from flattening the poultry.